By today’s standards the original Teddy Ruxpin, essentially a stuffed toy bear wrapped around a cassette player, borders on archaic, but in 1985 few toys incorporated any kind of technology, and the bear felt as futuristic to a seven-year-old version of me as the original iPhone did a decade ago. It was one of the first toys that helped spark my lifelong obsession with gadgets, which is why I’m disappointed that the new Teddy Ruxpin, which mostly just mirrors the original’s capabilities, doesn’t feel revolutionary in any way. A Teddy Ruxpin for the digital age. When powered off it seems to have no soul. Thanks to the abolishment of FCC guidelines limiting advertising in children’s programming, the ‘80s cartoons that many of us fondly remember were, in reality, nothing more than 22-minute long commercials that gave birth to popular toy lines like Transformers, G.I. Joe, He-Man, Voltron, and Thundercats. They were so effective that ‘80s nostalgia has become a valuable marketing tool in the toy industry, as is evident by all the brands revived as collectible exclusives at this year’s San Diego Comic-Con. Removing Teddy Ruxpin’s vest reveals a battery door hidden on his back, as well as power and Bluetooth switches. So with nostalgia, technology, and a kid-friendly design all going for it, you’d assume that the new Teddy Ruxpin, now produced by Wicked Cool Toys, has everything it needs to be an even bigger hit than the original, produced by World of Wonders, was. But when it comes to toys packing technology, there’s a lot more competition for the bear in 2017 than there was in 1985. And if you’re worried about Teddy’s moving mouth injuring a kid’s finger, don’t be. The compliant mechanism it uses stops moving when it hits an obstacle with little to no force, and I let it gnaw on my finger for a few minutes with no discomfort, and no regrets. Taking advantage of 32 years of electronics miniaturization, the new Teddy Ruxpin no longer feels like you’re lifting a hefty cassette player that’s been wrapped in fur. There’s still a giant box of electronics inside Teddy’s torso, however, mostly due to a set of four AA batteries crammed in there. A sleeker rechargeable battery inside might have helped to better shrink Teddy Ruxpin’s electronic footprint and make him feel even more cuddly. Most of the modern Ruxpin’s guts have been electronically upgraded, but the toy still includes a mechanical mouth that moves in sync with stories and songs played by a speaker also hidden inside the bear. The motors powering the mouth are considerably quieter than what the original Teddy used, so the bear’s voice doesn’t have to compete with the sound of grinding plastic mechanisms, but it’s definitely still noticeable. A pair of LCD displays give the new Teddy Ruxpin far more personality than the original one had, but it’s a new approach to plush toys that some of my co-workers didn’t find as endearing. The new Teddy Ruxpin’s most obvious upgrade is a pair of glowing LCD eyes that proved to be a divisive feature among Gizmodo staffers. Gone are the mechanical moving peepers of the original Ruxpin that terrified a seven-year-old Andrew who found them eerily similar to the soulless eyes used on ventriloquist dummies. I was happy to stare in awe at the original Teddy Ruxpin behind glass at Toys “R” Us, but at no point did I ever want to invite that bear into my home. Teddy Ruxpin’s eyes use a low-res LCD screen, but it doesn’t hinder the toy’s expressions. As a result, I’m all in when it comes to using technology like this (I previously championed LCD eyes on Sphero’s Ultimate Lightning McQueen and interactive Spider-Man toys). They allow a toy to express more emotions, more personality, and can simulate a deeper engagement with a child. Many of my co-workers, who are clearly wrong, staunchly disagreed—finding the bear’s glowing eyes unsettling. Terrifying coworkers with nothing more than a GIF of Teddy Ruxpin staring them down was an easy feat this week. Okay, when powered off, Teddy Ruxpin’s eyes do come off as a little creepy. 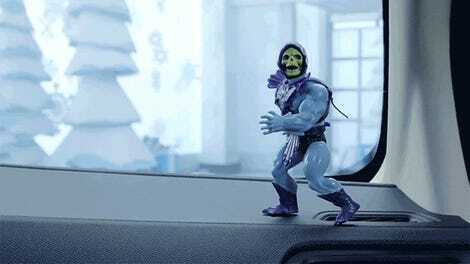 Is LCD technology the best way to bring a toy’s eyes to life? Probably not, as is evident by the fact that the new Teddy Ruxpin comes with a blind-fold to hide his dead eyes when the toy is powered off. A low-power e-ink display that doesn’t need a blinding backlight would almost certainly work better here, but LCDs are cheap and plentiful, and Teddy Ruxpin already comes with a $100 price tag. In lieu of cassette tapes, the new Teddy Ruxpin goes all digital for its storytelling. Out of the box you can squeeze the bear’s paws, or press the badge on his vest, to control playback of three included stories, which incorporate songs and other kid-friendly content. When connected to a free accompanying iOS or Android app, kids can read-along with Teddy using digital storybooks, and parents can purchase additional stories, which will eventually require the bear to be connected to a computer over USB to download updates as the toy’s library expands. The move to digital might be a big disappointment for nostalgia seekers, however. Before the days of DRM, it was discovered that you could insert any cassette into Teddy Ruxpin and he would happily mouth along with whatever was being played. But the new Teddy Ruxpin can only play pre-approved content (at least until someone hacks the toy) which is decidedly targeted at a younger audience. No Trump rants will be emitted from the mouth of this anthropomorphic bear. She found other toys much more interesting. The original Teddy Ruxpin did things no toy had ever done before, capitalizing on a technology that had only been popularized a few years prior with Sony’s Walkman. But the new Teddy Ruxpin now has to compete in a market where it’s rare for a toy not to include some electronic functionality, not to mention smartphones and tablets packed full of endlessly entertaining apps. 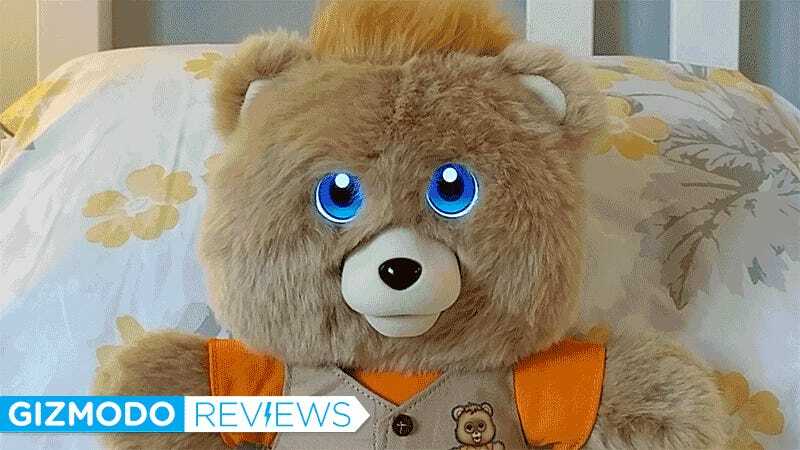 A Gizmodo staffer’s two-year-old, who has a history of loving weird robot toys, spent some time with both the original and the new Teddy Ruxpin. Not only did the eyes fail to bother her, she didn’t seem to have much reaction to either bear at all. Had the new Teddy Ruxpin included interactive features, like engaging with kids or responding to voice commands with even a basic level of intelligence, it would have easily been able to compete with toys like Hello Barbie, or Sphero’s new Spider-Man. But its dated functionality—basically reading stories and singing songs—means fewer kids will be interested. Nostalgic parents who grew up with the original might be the new Teddy Ruxpin’s most interested demographic, but in another 32 years the original Teddy Ruxpin will still be the one those retired ‘80s kids will be hunting for on eBay. Adorable, cuddly, but ultimately Teddy Ruxpin needs to learn some new tricks to compete with 2017's toys. Smaller electronic components make the new Teddy Ruxpin feel more like a stuffed toy, and less like a fur-covered boombox. Nostalgia-seekers obsessed with the ‘80s and their childhoods will be happy to see Teddy Ruxpin back in stores. The toy can only play pre-approved content unlocked via an official accompanying app. 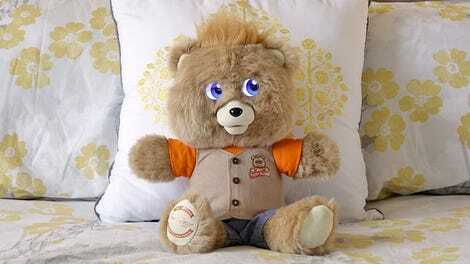 Teddy Ruxpin’s LCD eyes convey more emotions and personality, but look a little scary when Ruxpin is powered off. Minimal interactivity. Like the original, the new Teddy Ruxpin has kids just listening to or reading along with a story. Nostalgia sells, but are you sure the '80s were as wonderful as you remember?